Oster T Finisher review: Is It Worth it? With the high quality of Oster barber clippers, a lot of people forget the company’s trimmer potential. Which is a shame given the pure class of Oster products. The Oster T Finisher is an overall great hair trimmer for professionals, easily ranking among the industry’s best. It specializes in precision work and stays quiet and cool, more than some other barber trimmers. Its price is also budget-friendly. In this Oster T Finisher review I’ll also elaborate on how it performs in comparison with Andis T Outliner and Wahl Detailer. The Oster T trimmer enters the stage clothed in a slightly bulky casing. Adding a bit of weight to the grip you’ll get with it, it feels as a proper barber tool. Despite its bigger size than comparable trimmers, the T-Finisher has a narrow body. In other words, don’t fret about maneuverability. You’ll get plenty of it. This is a first among barber trimmers. Other contestants like the Wahl Detailer are locked into one design only. If you’re into being extravagant, you’ll love this feature of the T Finisher. In this Oster T Finisher review here’s the part you’re most interested in, surely. Out of the box, the Oster T trimmer comes with a 1.5″ wide T Finisher blade. It’s extremely precise in any trims and cuts. You’ll achieve accurate and beautiful ear trims, sideburn cleanups, neckline detailing and beard grooming. The T blade cuts somewhat close, even though you won’t get the closest cuts here. A Wahl Detailer will get closer to the skin and yield you sharper trimming action. Then again, the T Finisher is better for sensitive skin. My personal tip would be to consider Oster’s T-Shaving replacement blade. It will greatly improve how the T-Finisher trimmer performs. Compared to the stock T-blade, the T-shaving blade achieves finer, closer and overall more detailed trims and cuts. Not cheap at all, but worth it. You’ll get 1/125″ trims and better cutting action with textured hair. You should always make sure that the bottom of the blade isn’t meeting the skin at an angle. Stay parallel and you’ll minimize any risk of nicking with the T Finisher. 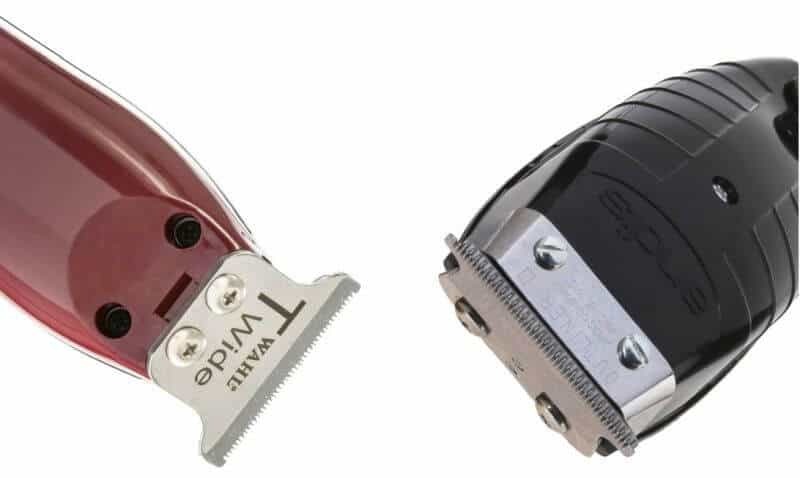 We’ve actually included all three models in our best trimmers for barbers list. And there’s a reason for that: they’re quite comparable with each other. What really matters here is what you intend to use these hair trimmers for. For example, the Detailer is the most stylish, compact, and easy to zero gap of the three. It’s not that great for sensitive skin, though. The T Outliner from Amazon.com goes all in in terms of power. It’s 7200 strokes per minute electromagnetic motor allows for easier gliding through thicker hair types and great fades. It is, however, somewhat heavier and bulky compared to the T Finisher. Pictured below: Wahl’s Detailer and the GTX T-outliner model. Where the Oster T trimmer excels is smaller surfaces and accuracy. Its T blade is narrower so you’ll have an easier time maneuvering around tinier, more delicate areas. Especially in comparison with the T Outliner, the T Finisher also stays quite silent and cool. Andis’ trimmer poster child is well-known for its power, yes. However, its motor leads to some overheating issues. It’s also noisier than Oster’s offer on the table. If you prefer a calmer approach to grooming your hair and face, you’ll love the T Finisher. Just know that you’ll sacrifice the raw power of the T Outliner trimmer. What Oster giveth, they taketh. You have access to amazing designs like the stylish chrome-colored T Finisher. However, you won’t get the accessory perks you’ll receive with other pro groomers. You can count only on a cleaning brush and clipper oil here. No additional combs, not even a blade guard. In fact, finding T Finisher guards is very, very hard due to the blade’s specifications. As I already mentioned, the T-trimmer is a bit more demanding. The stock T-blade is not bad at all, but if you want to reap proper results, you’ll have to fetch the T-shaving one. This is an obvious disadvantage for people who want to stay on a budget. I’m not saying this is an absolute requirement. But it impacts the overall performance. 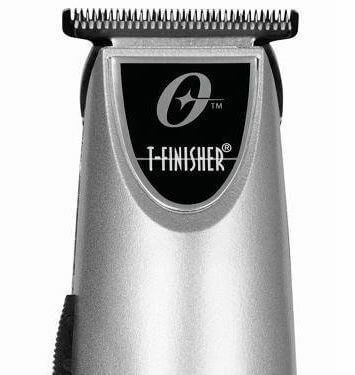 Last but not least, the slightly unexpected bulky feeling of the T Finisher trimmer. However, if you’re familiar with Oster, you know how their vintage designs are. Nothing new on the horizon – and not a dealbreaker at all. Especially if you’re looking for a professional hair cutting tool. This Oster T Finisher review shows that Oster’s T-trimmer is on par with other leading professional groomers. It will perfectly fit an Oster Fast Feed clipper or that classic 76 beast for a true Oster barber experience. You’ll score precision cuts and great detailed work. A great selling point with this model is the cool, quiet operation. The brand’s products are usually exactly the opposite, but here Oster have outdone themselves. Much smoother experience compared with other heavy-duty trimmers. The trade off is lack of accessories and the Oster T Finisher blade details I discussed before. Overall, though, the Oster T trimmer is definitely worth the money. A great groomer, no doubt. Just make sure it suits your needs.